Place d’Armes is an old square that is located in Montreal, Quebec. There is a statue of Paul de Chomedey, who founded Montreal, in the center area of the square. 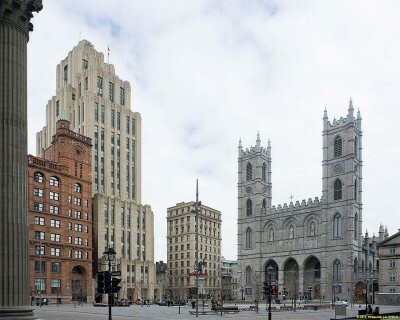 There are many notable buildings that are around the square, such as Saint-Sulpice Seminary, Notre-Dame Basilica, Aldred Building, Bank of Montreal and the New York Life Building. Place d’Armes is the one of the oldest public sites in the Montreal area. The square was created in 1693 when the first Notre-Dame basilica was demolished and a new one was built. The area was originally known as Place de la Fabrique. In 1721, the Sulpicians requested that the name be changed to Place d’Armes after the military started using it for various events. It was used for a wood and hay market in the late 18th century up until 1813. In 1826, the city acquired the property and developed it into a beautiful Victorian garden. The buildings that surround the Place d’Armes represent many different eras. 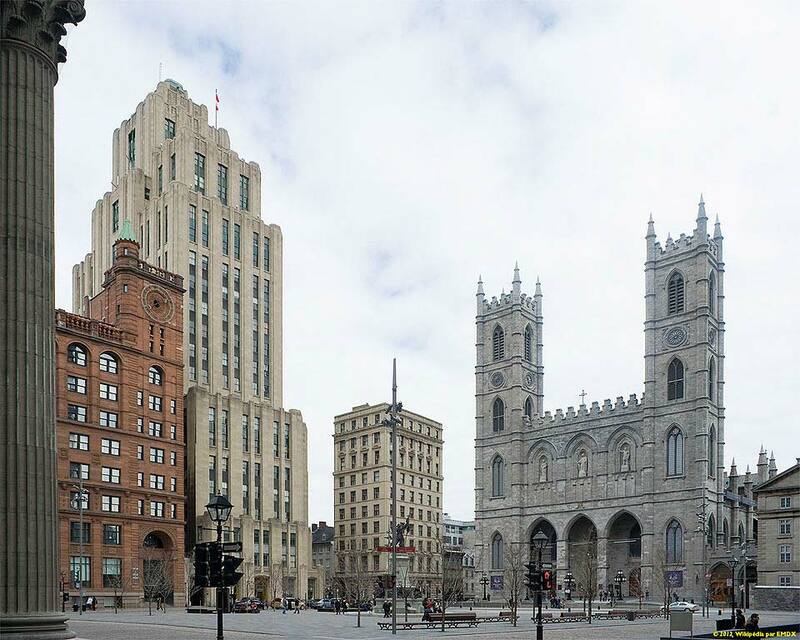 The center piece of Place d’Armes is the beautiful neo-Gothic Notre Dame Basilica that was built in the 19th century. In 1888, the New York Life Building was built and it had the first elevator in the city. The building has eight stories and a very decorative clock tower. Parts of the exterior were designed by sculptor Henry Beaumont. In the 1920’s, steel skyscrapers started being built around the square which include the Duluth and Royal Trust Bank buildings. During this time, Montreal had an interesting architectural rule that specified all skyscrapers had to be set back to provide enough sunlight for the street. A good example of this design is the Aldred building. Place d’Armes features a statue of Paul de Chomedey that was created by Louis-Philippe Hébert in 1895. It commemorates Chomedey’s defense of the city against the Iroquois when Montreal was a young French settlement. The monument also has several other bronze figures.